Bursitis is inflammation of a bursa. A bursa is a thin sac that lies between bone and soft tissue. It can be found near some joints. A healthy bursa allows smooth movement of soft tissue over bone. 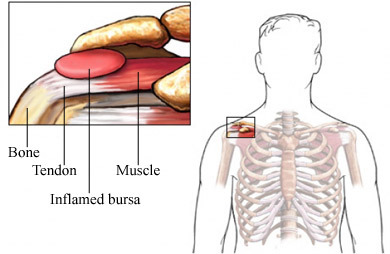 If a bursa becomes inflamed it can make movement painful. You will be asked about your symptoms. The doctor may also ask about your daily habits and any injuries. The painful area will be looked at carefully. The diagnosis is often made based on how the area looks and symptoms. Often only offered for bursitis that is very painful and not responding to basic care. Have short-term benefits and some risk. Talk to your doctor about benefits and risks for you. Do a gradual increase in the intensity and duration of your activity. This is very important when you start new sports. Use proper protective pads if you play contact sports. Use proper safety equipment at work. Work with an ergonomic specialist. They may be able to help decrease stress on joints. This works best in jobs with repetitive motion or long periods of pressure on the joints. Edits to original content made by Denver Health. Bursitis. The Ohio State University Wexner Medical Center website. Available at: http://wexnermedical.osu.edu/patient-care/healthcare-services/arthritis-rheumatology/bursitis. Accessed November 10, 2017. Bursitis. National Institute of Arthritis and Musculoskeletal and Skin Diseases website. Available at: https://www.niams.nih.gov/health-topics/bursitis. Updated February 28, 2017. Accessed November 10, 2017. Elbow (olecranon) bursitis. Ortho Info—American Academy of Orthopaedic Surgeons website. Available at: http://orthoinfo.aaos.org/topic.cfm?topic=A00028. Updated January 2011. Accessed November 10, 2017. Hip bursitis. Ortho Info—American Academy of Orthopaedic Surgeons website. Available at: http://orthoinfo.aaos.org/topic.cfm?topic=a00409. Updated March 2014. Accessed November 10, 2017. Prepatellar bursitis. EBSCO DynaMed Plus website. Available at: http://www.dynamed.com/topics/dmp~AN~T114661/Prepatellar-bursitis . Updated June 5, 2017. Accessed November 10, 2017. Tendinitis and bursitis. American College of Rheumatology. Available at: https://www.rheumatology.org/I-Am-A/Patient-Caregiver/Diseases-Conditions/Tendinitis-Bursitis. Updated May 2015. Accessed November 10, 2017.